If you are like most people then your car is one of your most valuable possessions. You will do almost anything to make sure it looks great and runs well. That is why it is so surprising that many people overlook some very simple maintenance steps that can help keep your car looking great and running properly. One of those simple steps is getting a windshield sun shade for your vehicle. 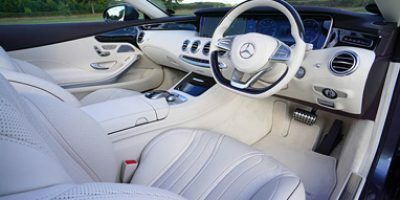 They will keep your car interior from getting ruined prematurely and also keep high heat away from your sensitive interior electronics. Having the best windshield sun shade you can get for your vehicle really will help keep the heat down in the interior of your car during the day. Check out the following top-rated car sun shade reviews! Like the title says this is a very large sunshade that measures a generous 70 x 35 inches. This nylon windshield sunshade does a great job of totally blocking sunlight that comes through the big windshields that some vehicles have. 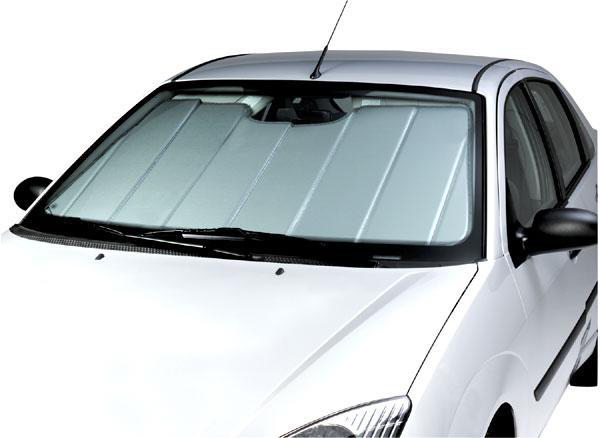 It is a popup type windshield sunlight blocker that conveniently folds up for easy storage. This sun shield contains two built-in reinforced inserts for stability and also comes with a complete 30-day money back guarantee. The best thing about this product is the fact that it will easily fit a larger size vehicle. Some regular sunshades will not cut it when it comes to entirely block sunlight that comes through bigger windshields of large SUV’s, pickup trucks and some brands of cars like Honda. Fitting on vehicles with larger windshields is what this sunshade was specifically designed to do. It was made out of nylon material to make it lightweight but that also brings into play some durability issues. This car windshield sunshade is also extremely hard to fold small so it will go back in the storage bag it came in. So you want to keep your car cooler and protect it from the heat. Than this inexpensive car sun shade can really help you. 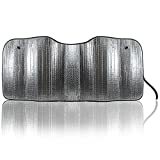 Coveted Shade Company really has designed a nice product here for keeping your car cooler on those hot days than normal. It is made of extremely thick and durable material so it should last you a long time. It nicely reflects even the sun’s harmful UV rays to keep the damaging heat away from your vehicle. The best thing about this car window shade is its versatility in fitting all different sizes of medium or small vehicle windows. That is because it is designed around having two 27 inch rigid circles embedded in it for each side of the windshield. The rest of the shade is flexible so you can make adjustments to the fit. A few of us thought that although the fit of this car shade was very versatile, it was not as snug up against the windshield as we would have liked. Also, if you are not an expert at folding it you will have trouble getting it back in its storage bag. This is a nice little sunshade product for sure and there is certainly a lot to like about it. It does a great job of stopping the sun’s harmful UV rays from affecting your dashboard area and keeping the interior of your car much cooler when it is parked for a long period of time. This sun shield is made out of dual layers of reinforced nylon fabric. 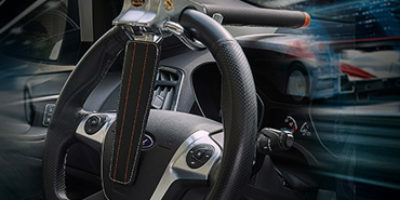 It features an unbeatable full lifetime warranty and also comes with a rubber dashboard pad that will hold any cell phone nicely in place as you drive. The best thing about this premier car windshield sunshade is how easy it is to set up and take down. It literally takes less 2 minutes of your time to take it out and have it set up and working to protect the interior of your vehicle from heat buildup. 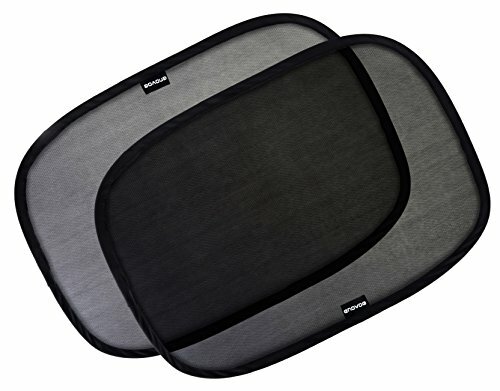 The bad thing about this windshield sunshade is that it has a foldable type frame around it that can make it difficult to put in some smaller windshields. This device will also not fit on larger SUV’s and other cars or trucks with big windshields. This is an adaptable sunshade product that is really easy to use. In no time at all, you can have it in place and nicely protecting the inside of your vehicle from extremely high heat and sun damage. This medium to large size sunshade is made using two rigid type inserts that each covers half the window. The extra fabric outside these inserts then adjusts to perfectly fit almost any size windshield. It also twists and folds for easy setup and takedown. 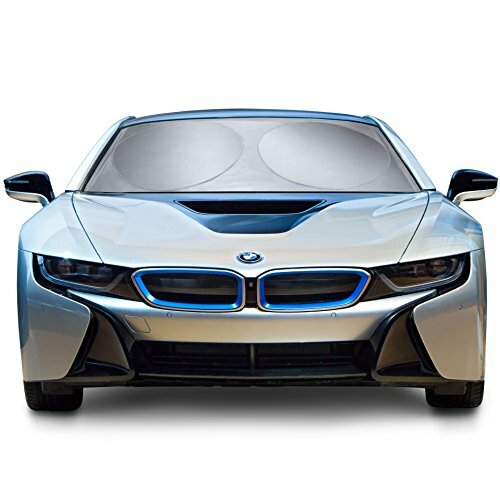 You will simply not believe how well this windshield sunshade works for the extremely low price you will pay for it. It will pay for itself over and over again as it helps keep the sensitive interior of your vehicle from building up to harmful heat levels. It is 99% effective against harmful UV rays and 95% effective as a heat barrier from sunlight. There are a few things we have noticed here. For one, sun shields that come with inserts instead of frames often work great but fit a little awkward as is the case here. We believe there may some durability issues with this model but not a huge concern with the price you pay for it. 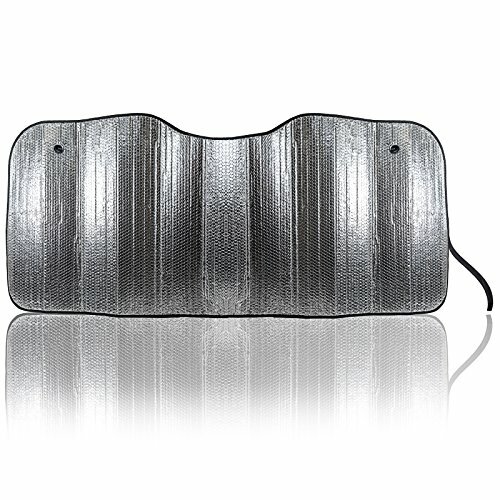 This is the first accordion design windshield sunshade on our list and it’s a pretty good one. These tend to be the easiest style sun shades to put on and take off a vehicle. This one is designed to fit even the largest sized windshields. It weighs just a scant 5 ounces which makes it highly portable and the material it’s made out of is extremely flexible. It even has a storage strap conveniently sewn right into the sunshade fabric too. OxGord has done a nice job with this accordion design. It folds out and installs very easily and then it folds back down quickly too. It makes this sunshade not only good to use when your car is sitting all day, but even when you just run into a store quickly. It takes no time at all to put this sunshade in place. We like this sunshade but we can see some real durability issues with it over the long run too. The reflective material that covers the outside of the shade can scratch off and puncture very easily too. mAUTO has designed a nice medium sized windshield sunshade here. It is called the happy eyes model because when it is on your vehicle it will make your car’s windshield look like it has two eyes. It’s also reversible and there is a little more basic color pattern on the reverse side. It’s a very easy to install sun shield that features a UV resistant coating on its fabric. The material is over 2 inches thick which helps insulate your vehicle from windshield heat buildup too. Most of us that looked at this sun shield really liked how thick it was. mAuto describes it as a dual-layered windshield sunscreen. It was so thick it does a great job of repelling the sun and insulating that sunlight from warming up the inside of your vehicle too much. Call some of us old school but we really did not like the eyeballs that were incorporated into the pattern of this sunshield but it still works well. Pay close attention to the size of this sunshield too because it will only work on smaller vehicles for sure. Material : Top quality nylon materials. If your vehicle is considered to have a large windshield, then this sunshade will nicely help block the heat that enters your car through it. Pro Shade has designed a very nice car windshield sunshade here. 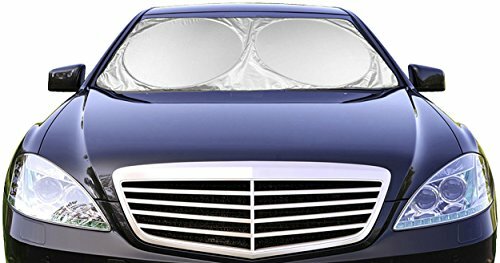 This windshield shade has two inserts built into its fabric to help stabilize it. Its fabric is specially designed to block the sun’s harmful UV rays and significantly decrease the interior temperature of your vehicle as it sits in the sun during the day. 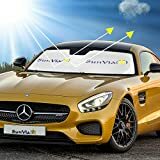 The best thing about this car sunshade is that it will fit into the windshields of many larger vehicles to help protect them from heat buildup. 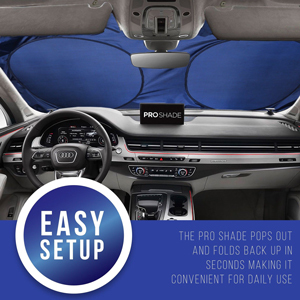 Pro Shade describes this product as a ‘Jumbo’ sun shield and they are right because it will fit vehicle windshields that are up to 64 inches wide. This is not a very versatile sunshield product because it is definitely not made to fit in the windshield area of smaller size vehicles. It also is not very easy to fit back into its carrying bag. Here is a vehicle sunshade that opens in a matter of a few seconds and can be in place next to your vehicles windshield in no time at all. It is more durable than many car sunshades’ because it uses a unique reflective silver nylon thread in its construction. It goes into place very easily and covers most windshields completely when in position. This sun shield product even comes complete with its own handy storage bag. The key to this product is the two 30 inch inserts that are woven into its fabric. 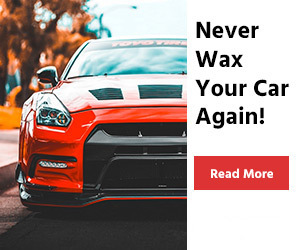 This help make the product very easy to put into place and then keep it there solidly while it goes to work blocking the harmful UV rays that can hurt your dashboard area. It is a little bit cumbersome to put up in smaller size vehicles because of the size of its inserts. The area outside of the inserts is very flimsy and this makes it hard to keep in place on some types of windshield shapes. Here is another fine windshield sunshade from the reputable Shade-It Company. They did a really nice job with the design of this front window sun shield. It does an excellent job of protecting any vehicles dashboard from the sun’s harmful UV rays and at keeping a car interior much cooler while it is parked on a sunny day. It easily fits windshields up to 64 inches wide and 34 inches in width. The material it’s made of is very durable and nicely reflects the sun away from your car. This is a good looking sun shield product that provides thorough blocking coverage from the sun’s rays entering your vehicle during the daytime. It looks good because it covers 100% of the windshield area of the vehicles it’s designed to fit in and it does it without appearing bulky and unsightly in nature. 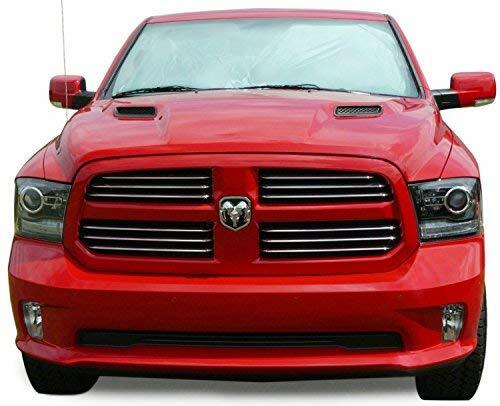 One of the concerns we had with this product is it can run a little bit big in size and because of that we definitely do not recommend you purchase this sunshade if you have a vehicle with a smaller windshield. Here is a really generous size windshield sunshade that is made by the X-Shade Company. It is not the biggest sunshade we have seen but it will easily do the job on most medium to large size vehicle windows. It really does a nice job of keeping your vehicle’s interior cool during the day. 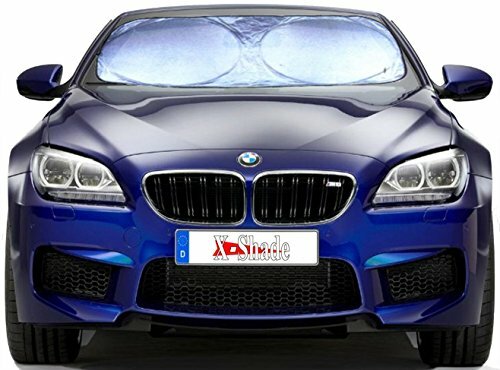 It’s an insert style sunshade which tends to stay in place very well and do a nice job of repelling the sun’s harmful UV rays as they attack your car while it is parked in the daytime. This line of sunshades comes with a great guarantee from X-shade as far as fit is concerned. They say if it does not fit they will replace it with one that does no charge. That is a pretty good peace of mind to have when purchasing it. This product can be a little tough to size correctly and that is a problem if you have to pay the freight to return it. It is also very hard to fold small enough to get back inside its storage bag. These are sunshades that are made for the side windows or as a quick two piece front windshield installation. They do a nice job of keeping the sun of the kids in the back seat on a hot day or as a fast window insert while you are making a short trip to the grocery store or to do other shopping. They are a dual-layered product that provides excellent insulation from the sun’s intense heat during the day. Each panel is 21 x 14 inches. There is a complete money back guarantee with these sun shields too. By far the best thing about this product is their compact size. It makes them very convenient to put them in your windshield quickly. They are small enough that you don’t even really need to fold them up completely to store them. There is no question that these sunshield panels are a good product that works well, but with that being said they do not function nearly as well as a windshield sunshade as they do for as a side window sunshade. They do not give you anywhere near 100% total windshield coverage. If you need sun protection for the interior of your vehicle that has a larger size windshield, then the product may be exactly what you are looking for. Coveted shade has come up with a very nice windshield sunshade design here. This product installs easily and completely covers any windshield it fits. It is a very generous size sunshade at a full 63 inches long and 33 inches high. 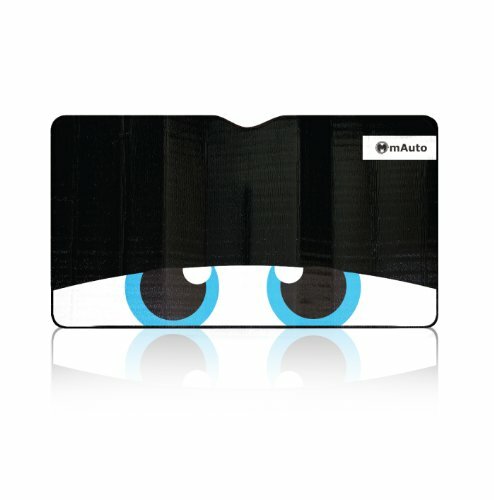 This product is also made out of very durable and very reflective type material. This is a really easy sun shield to install and store. It pops up when taken out of the package so that it can be installed in less than 1 minute. It’s also one of the easiest sun shield products to fold and store that we have come across. You will probably need to purchase some Velcro tape to keep this sun shield installed firmly in place. They can be a little tough to size properly too, so be careful when ordering one to make sure you get the right size one. Most people are falsely under the impression that they can just walk into any store that sells auto parts and grab the first windshield sun shield they come across and be completely satisfied with the product. That is hardly the case because all of the different designs and sizes there are in car sun shield products. There are certain characteristics you have to look at in order to purchase the right one for your vehicle. Here are some of the key features you need to look at before purchasing a windshield sunshade for your vehicle. To be honest, the price is not usually a huge factor when you are searching for a vehicle sunshade. 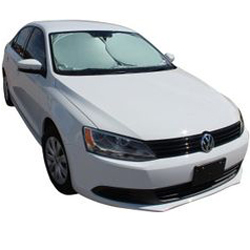 With very few exceptions windshield sunshades are a very reasonably priced item. But that does not mean there aren’t some real bargains to be had when it comes to making a sun shield purchase for your vehicle. An increase in the price of as little as $10 can also mean you are getting a high-quality vehicle sun shield that is well designed and will last a long time. As far as durability goes you usually get what you pay for when it comes to these types of products. There is no one size fits all solution when it comes to windshield sunshades. Just like there are many different sizes of windshields found in many different types of vehicles, so too is there a variety of windshield sunshade products to fit them. Size is important when buying these types of products because you really want to get one that covers 100% of your windshield in order to block all the UV rays that would normally pass through your windshield. So make sure you measure your windshield as exact as possible in order to get a windshield sunshade that does the job properly for you. The fit is closely related to size too. Most windshield sunshades have some type of flexible wire framework built into them and some other fabric that extends past this flexible framework. 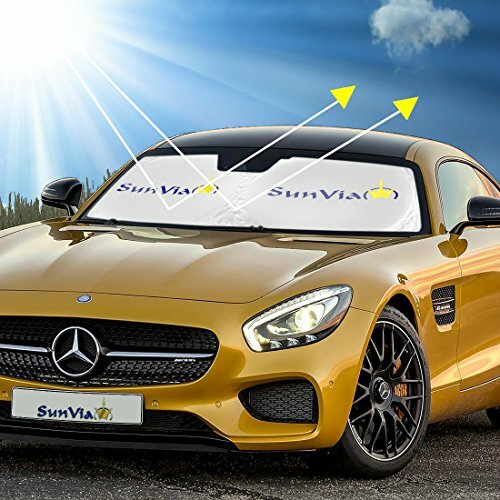 You want your sun shield to have this extra fabric so it makes it possible to fit your sunshade completely around the inside of your windshield in order for it to work properly. This is one of the two most key components to look at on any windshield sunshade you are thinking about purchasing (the other is size). The material a sun shield is made out of and how thick it is directly related to how well it works. You should look for a sun shield that is made of a material that is very reflective in nature; the sun’s powerful rays cannot get into your car if they are reflected away from your vehicle. The material a sun shield is made out of should also have insulating properties to keep heat from transferring into the car from a hot windshield too. Let’s face it; you do not have a great deal of room to work with on the inside of your windshield above the dashboard. That means you want a windshield sun shield product that is well designed so it installs and uninstalls very easily. It has to be a compact model that stores easily but quickly opens up for installation once you go to take it out to use it. You also want it to be a model that does not take a rocket scientist’s skill set to fold up so it can conveniently be stored out of the way until it is needed again. There is no rule that says you can’t have a windshield sunshade that looks good either. So don’t be afraid to buy one with a little style to it as it decorates the windshield of that car you love and work hard to keep looking nice. There are a wide variety of colors and designs that windshield sunshades come in. Get one that both enhances the look of your vehicle and is somewhat reflective of the type of personality that you have. This will make you even happier that you spent a little money on a nice sunshade for your vehicle. For a relatively inexpensive product, you will be surprised that many of these sun shield products come with decent warranties too. A windshield sunshade can have everything from no warranty to a lifetime replacement warranty. So make sure you check the packaging or the manufacturer’s website to see what type of warranty you will get with any windshield sunshade that you are thinking about purchasing. A good warranty will give you a little extra peace of mind that you are making a sound sun shield buying decision. Most windshield sunshades are designed to be pretty easy to put on and then take back off. They will usually contain some type of wire framework, solid inserts or thick material for support. To install them properly you need to open them up fully, to begin with. Place the top end of the sun shield between the rearview mirror and the upper part of your windshield first. Next push the bottom of the sunshade up against the bottom of your windshield and then center it properly. Some sunshades will also have Velcro or straps to help with their installation. If there is any loose fabric around the edges push this up against your windshield to cover any exposed areas that the rigid part of your sunshade does not cover. Many windshield sunshades just rest up against your rearview mirror because there is no other way to secure them in place. This can be a problem because it can let more heat into your car than necessary. Don’t worry though if you have a sunshade that does not fit up against your windshield tightly, there is something you can do to correct this. All you have to do is go to your local department or craft store and buy yourself some Velcro tape. Get a color that closely matches your vehicle’s interior. 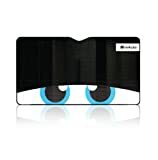 Cut it into 1 ½ inch strips and apply it to your sunshade and car window frame in corresponding spots. Velcro the sunshade onto the spots on the frame and this will not only keep it firmly in place when using it but it will also make it easy to remove from the windshield area too. Find the frame or the inserts that provide stability for the sunshade. These are the key to getting it folded down to a small size again. For wireframe type models you need to get the frame completely broken down to its smallest state. Sunshields with inserts needs to have the insert frames broken down into the smallest of section sizes too. Save folding any additional fabric that a particular sunshade may have for last. That way it will not jumble up inside the frame or inserts and contribute to them being bulky. Common sense will tell you how this extra material needs to be folded to make the sunshade as small as possible to store it. Do you wonder why people tint their vehicle’s windows? Everything you need to know about window tinting! If you follow the advice given here you stand a good chance of finding an excellent quality sunshade to place behind your vehicle’s windshield while it is parked. We have told you there is a lot of different styles and size sun shield products to choose from so don’t just buy the first one you come across. Take the time to find the best windshield sun shade for your needs. Also, make sure you refer to our sunshade reviews in order to determine how the car sun shade products are made.